We all have items in our homes that we have kept and in truth it just fills up the empty spaces, you never look at it, you might not even like it but it is there. This stuff comes in a multitude of disguises, from pieces of paper to items of furniture. How do you get rid of stuff that you don’t really want but feel guilty about disposing of the items? They might have some sentimental meanings but unless you love them, or, it’s something that you should feel obliged to keep? Alternatively, is it better to get rid of these items? Just have the things that you truly love in your home. You need to look at the item and decide if it is something that you truly want to keep, you might consider a colour change for it to fit into your home, whatever you decide, it must fit your needs and if you don’t love it you might just have to consider to get rid of stuff rather than holding on to things you don’t need. For a long time, I have kept items that have no meaning to anyone else, just me. The kid’s birthday cards, which they got, they don’t want them and they are cluttering up my home. The idea I have is to lay them all out and take a picture, this will allow me to remember the times gone by and the cards I can add to my paper block-recycling project. It clears up the problem of storage as I can look back at these pictures I save in the cloud, that doesn’t take up any physical storage in my home, giving me a sense of more space. You do have choices, you don’t have to hold onto things that you don’t need; they can quickly become clutter and this can have a negative impact on how you live your life. It is possible to change the look of items, if you think that it is just the current look of an item that you don’t like then think about changing it, you can even buy paint that will cover most types of material. There are items which you collect over the years, you think that you want, but in truth there are no real reasons for holding onto the item, no one else sees their value and any memories that they hold are all inside of you and not trapped in a possession or too. Letting these items go isn’t going to make those memories disappear, they will still be with you until you die. A great way for letting go of the physical stuff is to have a picture of the item, you can then download them onto a digital photo frame to remember the items without them being there! If you say yes to everything offered you might quickly become swamped in stuff that you don’t really want, but you don’t want to hurt someone else’s feelings. The problem with this is your house becomes cluttered with things that you don’t want or need. The person offering might think they are doing you a favour when in truth you are just taking off their hands all the items that they no longer want or need. If you learn to say no to the items that you don’t want, then you are in control of the items coming into your home, you then need to get rid of the items you own but don’t want. If they are serviceable you might try selling the item or giving it to a local charity to sell. If it isn’t worth any money then the only option you have is to dispose of it thoughtfully, making sure that if possible, fewer items end up in the local landfill site. Therefore, if you are trying to get rid of stuff that you have kept, you need to make those tough decisions. If you aren’t ready to let go just yet, then that is OK too, they are your things after all. 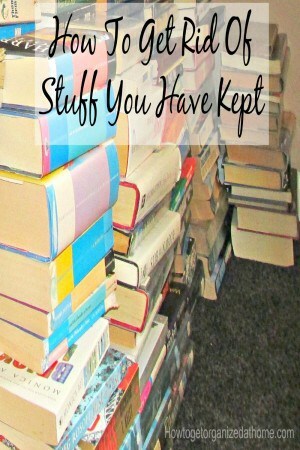 What is your best tip to get rid of stuff? 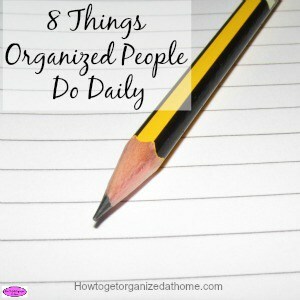 I recently wrote an article about 8 Things Organized People Do Daily, I think you will enjoy it!